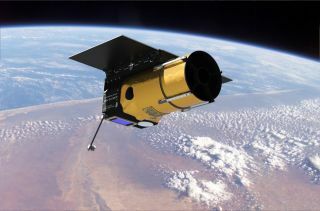 An artist’s illustration of the Arkyd telescope being developed by asteroid mining firm Planetary Resources, which hopes to launch one Arkyd as a crowdfunded instrument meant to serve the public. The world's first crowdfunded space telescope may add planet hunting to its skill set. Late last month, asteroid-mining firm Planetary Resources promised to make one of its Arkyd telescopes available for public use if $1 million could be raised for the effort by June 30 via the crowdfunding website Kickstarter. "While the Arkyd won’t rival NASA's $600 million Kepler spacecraft, which may have to end its mission due to a recent equipment failure, the enhanced Arkyd will be a huge step toward important new scientific discoveries enabled by citizen scientists," Planetary Resources president and chief engineer Chris Lewicki said in a statement. Like Kepler, the Arkyd would be designed to detect planetary transits, noting when alien worlds pass in front of their host stars. Giving the Arkyd this ability would require improving its stability systems and devoting time to study candidate stars, officials said. "The enhanced version of the Arkyd telescope will be an important source of data for exoplanets that can only be obtained from space, above the blurring effects of Earth's turbulent atmosphere," said MIT exoplanet scientist Sara Seager, a Planetary Resources adviser. "We're excited about this game-changing approach that could transform how we do science in the future," Seager added. "It's not just about advanced technology in a small satellite, but a crowdfunded approach to space science that could be revolutionary." Planetary Resources — which counts Google execs Larry Page and Eric Schmidt among its investors —aims to mine near-Earth asteroids for resources such as water and precious metals, with the ultimate goal of helping expand humanity's footprint out into the solar system. The company aims to launch a set of tiny cubesats to Earth orbit next year. These "Arkyd-3" satellites will test out technologies for Planetary Resources' 33-pound (15 kilograms) Arkyd-100 scouts, which the firm hopes to launch to low-Earth orbit on asteroid-hunting missions in 2015. A series of other robotic spacecraft will follow the Arkyd-100, investigating near-Earth asteroids up close and eventually mining their resources, officials have said. Planetary Resources officials say students, teachers and other citizen scientists will be able to point the crowdfunded Arkyd at pretty much any space object they wish. You can learn more about the Arkyd Kickstarter campaign here.